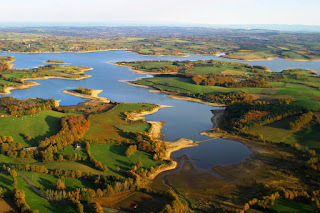 The relatively high altitude of the lake (805 meters) often provides for a (strong) wind on the water, which is important in the choice of equipment for carp anglers on this mountain lake. Those fishing Lake Pareloup will have experienced its strong winds. It seems like it never stops blowing. Because of the high altitude, there is a huge variation in temperature throughout the year, with a difference of about 2 degrees (Celsius) in winter to 22 degrees in the summer. A glance at the map of France shows the unique structure of Lake Pareloup with many branches through which rivers are each fed to the end. These coves are excellent carp fishing spots. Lac de Pareloup is known for its strong and big carp with many catches of at least 10 kg during a multi-day session. The average catch weight currently is 7 kg, with a few fish over 25 kg as top specimen carp. Approximately 60% of all the carp consists out of mirror carp, supplemented with 40% common carp. The beauty of the (mirror) carp is the large variation in Pareloup with beautiful 'fully's' 'linears' and leather carp. Interesting is the periodic "vidange ', or the draining and cleaning / maintaining what happens periodically to all French reservoirs. These are usually also used to stock the lake with new carp, which can grow in the following years to record fish years later. Other fish on Pareloup are big tench and bream, that are often being reported as side catch by carp anglers. Fishing is allowed on almost the entire lake, which has an average depth of 12 meters. In the branches, the depth is approximately 6 meters and delivers the best spots for carp anglers. Also there is a camp site ( Caussanel ) at the lake which is perfect for a combined summer and fishing holiday with the family. Another alternative is Les Genets , which also lies on the lake. In summer it is obviously very busy, especially around the many beaches on the water. Night fishing is allowed on the entire lake, with the exeption of several spots that are privately owned. Around the lake there are four special places where a boat can be put into the water (see map below). Please note that the lake has four special zones where fishing is prohibited in the spring to protect the fish. The zones are shown on the map below (red zones in the corners of the lake). It is also good to know that there are massive fines in France for the live transport of (large) carp. 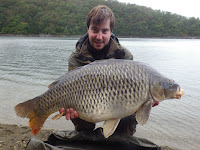 Anyone crazy enough to not catch and release and instead moving carp of 60 cm or greater can be fined up to € 22,500. For more information about the needed local licenses, please visit the website of the local fishing federation ( Federation de Peche de l'Aveyron ). Of course you can also head straight to the general website of the French fishing federation ( cartedepeche.fr ) for all licenses to be used in France. As a foreigner it's also possible to book a fishing license for public waters in France for a short period.